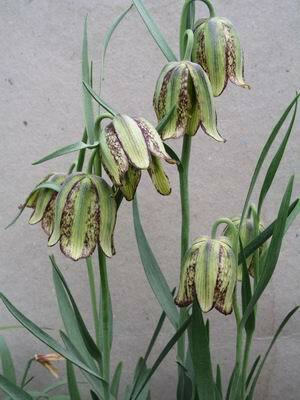 It was Janis Ruksans that introduced us to Fritillaria meleagroides. It is a tall growing species with lovely flowers that are a bit like a polished and shiny version of F. pyrenaica. 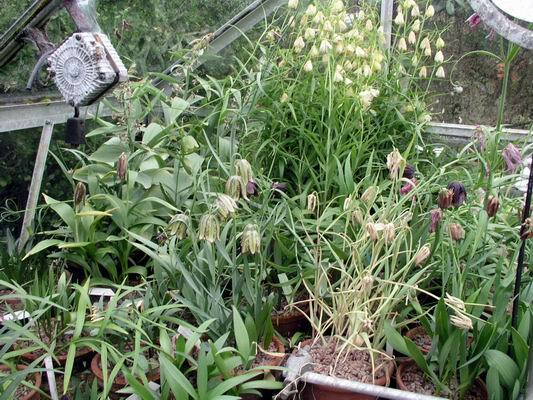 We have only grown it under glass so far but I do not think there will be any problems growing it in the garden under the same conditions in which F. pyrenaica thrives - I will try it this year. 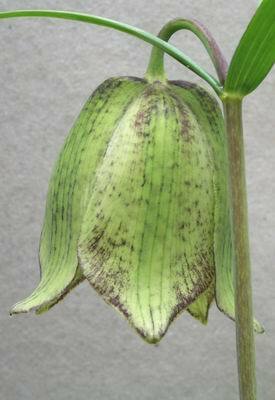 Fritillaria hispanica ( syn. F lusitanica) is the Spanish version of F. pyrenaica. This form which we got as F hispanica has more green on the exterior than the forms that we still call F. lusitanica which have more brown and so we use both names. They are easy to grow under glass and as soon as we build up our stocks we will also get it going in an outside bulb bed. 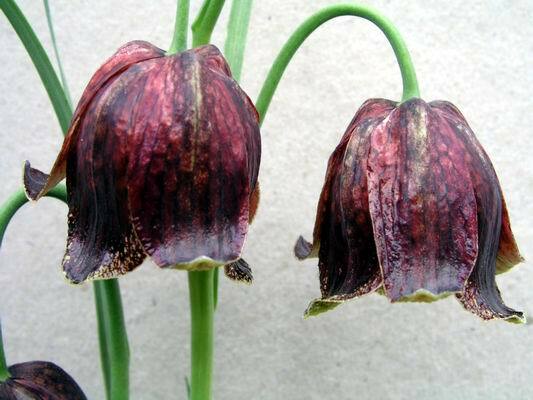 Fritillaria hupehensis is one of the Chinese frits it does not produce rice nor does it make offsets very often, so seed has to be the way to increase it. Fortunately frits will produce seed even though you only have one in flower - we have had seed twice from this single bulb and now have lots of seedlings, the first of which I hope will flower next year. In the frit house the first of the frits are going dormant and watering must be reduced. The plants have all completed their leaf and stem growth and as the seed pods swell next year's bulb is growing under ground, so less moisture is required. For many that are not setting seed this may be the last opportunity to apply a potash rich liquid feed for this year. Once the stems and leaves start going yellow you should stop watering directly into the pot but make sure the sand plunge is always moist. It is a balancing act between the bulb not having enough moisture and there being too much moisture which may rot the bulb as it progresses into its dormant period. 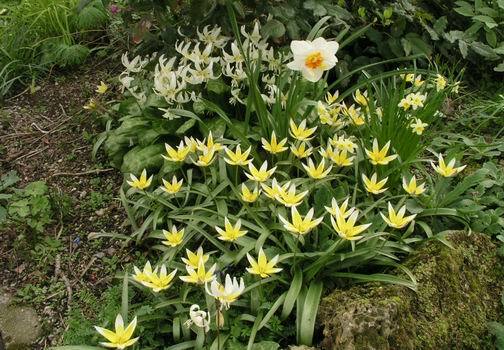 The same goes for Crocus, Narcissus, Tecophilaea, etc. Looking better every day just now is Tropaeolum azureum: this is our original John Watson plant grown from seed sown in 1987. Tulipa tarda has to be one of the best tulips for the cooler garden - many of its cousins need a long hot summer to flower well but tarda flowers and increases every year without fail and it has a lovely scent. 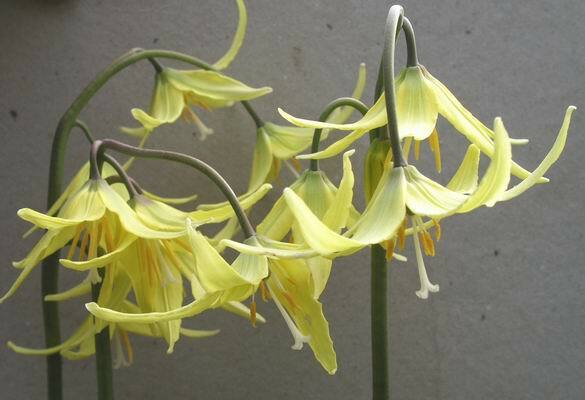 Erythronium 'Susannah' has to be the best E. tuolumnense hybrid I have seen. Raised by John Walker, it can have as many as five flowers per stem the largest of which can measure 10cms across. We now have some in a fish box so we can split it every year and so speed up the rate of increase. 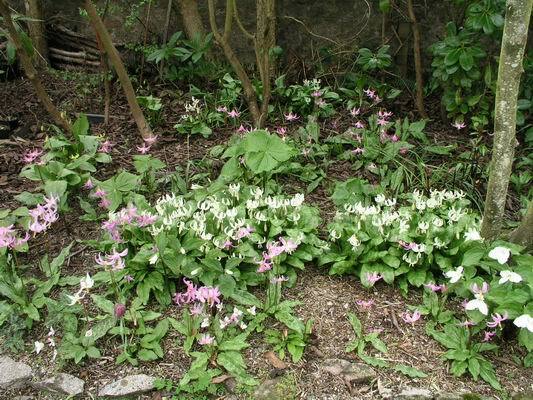 Our original group of Erythronium 'Cover Girl' is looking good just now. As you can see it is growing beside a tree and because of the roots it is very difficult to lift these bulbs . We did manage to get a few up some years ago and these we are growing in fish boxes so we can increase this lovely plant. Progress is progressing well with planting Trillium and Erythronium under the large Rhododendrons and we plan to extend this planting for the hole width of this bed. 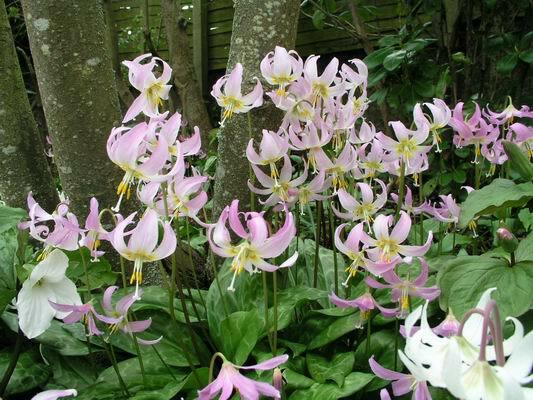 I also left all the Erythroniums to self seed last summer and there are hundreds of seedling leaves appearing : if only a small percentage reach flowering size, what a show we will have in a few years. 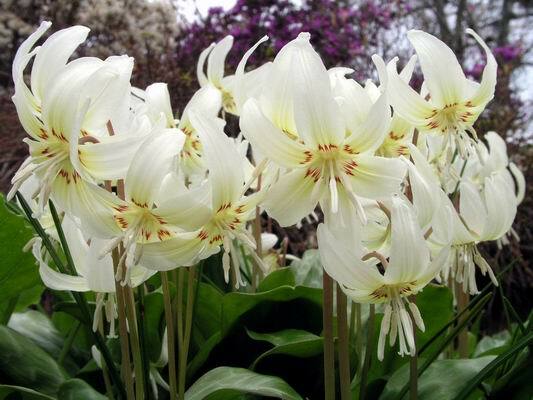 The excellent Erythronium 'White Beauty' should be in every garden, it increases well and flowers every year. Notice the pale cream pollen and the narrow filaments as these are the way to distinguish this from E oregonum. 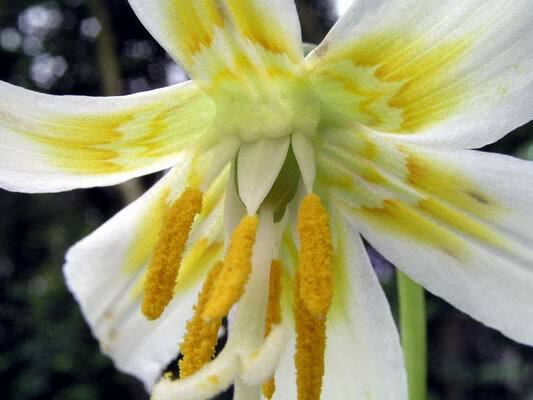 Erythronium oregonum normally has yellow pollen ( there is a cream pollen form) and the filaments are wide and expanded. 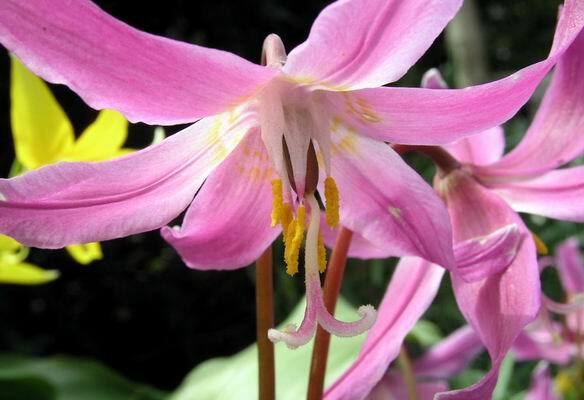 Erythronium revolutum has similar shaped expanded filaments but comes in shades of pink. This form also has purple/pink tips to the style and filaments.